Concerning this question by this user: The author's intent, to ask in order to find a solution for his problem, was a good one/idea. Actually it was a very good one, since doing usability research in this case asking the users currently should the preferred method for SW-engineers in writing "good" software (and here we finally a programmer who cares about the needs of the user in order to make a good product - even self motivated!). But the question was not appropriate to solve that problem and got deleted for good reasons. I would like to feedback a better question to the author (since I have a very good idea how to solve his problem), but since the question is deleted I can't do that directly through a comment. Is there another way? If the user is active on chat or has other contact details on their profile, you can reach out to them. Alternatively, you can ask a question of your own and answer it. The user in question appears to be new to the site and has no details filled in profile, so I dunno how you'd go about reaching out to them. But the question was not appropriate to solve that problem and got deleted for good reasons. The question was deleted by the author not the community. The author could have addressed the issues with the question, and would have recieved an answer to their question, which could still happen provided they ask a single question instead of four. However, none of the questions they have asked in the current revision, are not within scope here at Superuser. We must remember background context of those four questions, they are working to develope a SaaS for their company, and the author is seeking our feedback to those questions for them. The author's intent, to ask in order to find a solution for his problem, was a good one/idea. After the question was improved, the author never indicated, what problem they were attempting to solve. At one point the author asked, "Would a service like this be of use and does it solve any potential problems that the superuser community may have? ", which also wasn't appropriate for our community. Additionally, the last revision by the author was simply seeking answers to questions, in order to develop their SaaS (Software as a service) which wasn't an apprpriate question for Superuser. The author didn't actually have a problem to solve, they were seeking our feedback, to develope their SaaS (Software as a service). I would like to feedback a better question to the author (since I have a very good idea how to solve his problem), but since the question is deleted I can't do that directly through a comment. If they are seeking our input to develop their SaaS, their question should remain deleted, since that isn't something we will provide. The question should remain deleted if that is the case. While the user is registered, we are not a discussion forum, so there is no way to contact the author. Actually it was a very good one, since doing usability research in this case asking the users currently should the preferred method for SW-engineers in writing "good" software (and here we finally a programmer who cares about the needs of the user in order to make a good product - even self motivated!). What you describe is entirely out of scope here at Superuser. I would go as far to say, there is not a single SE community, where it would be within scope. 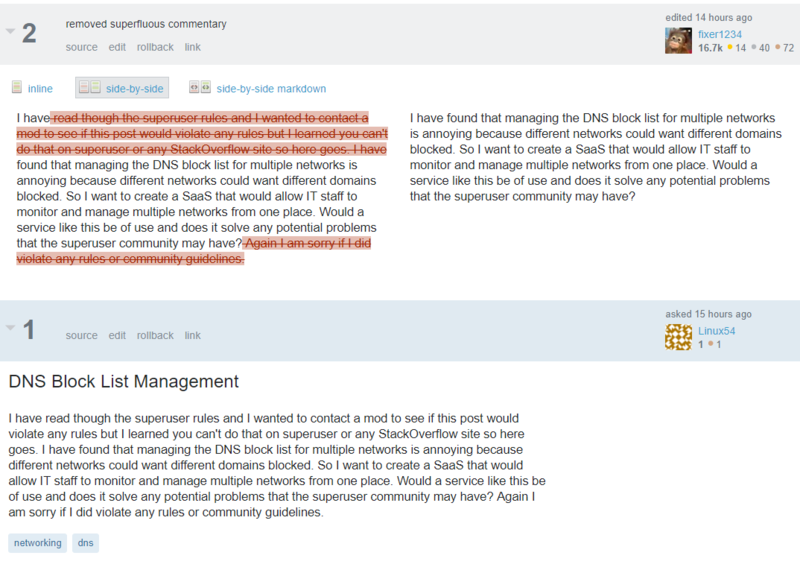 Stack Exchange communities are not discussion forums, it is inappropriate to use any SE community, to collect research to develope a software product. Should I downvote a question because I think it is beckoning trouble?